I've never subscribed to the notion that movie adaptations of literary works have to be completely faithful to their source material. Indeed, in some cases we can be glad they are not (Jaws springs immediately to mind), though if the original story is distorted enough you can't help wondering why the movie company paid so much for the literary rights if they are to use so little of it. Fyodor Dostoyevsky's The Idiot is a genuinely great work of literature, but a completely faithful adaptation would seem pretty much out of the reach of theatrical movies, given that to do so would push the running time well in excess of four hours. We know this because Kurosawa Akira, a huge Dostoyevsky fan, chose to make such an adaptation, and the finished work ran for 265 minutes. * The studio, Shochiku, were less than enthralled, and after a single screening of this version cut the film down to 166 minutes for general release. Get that? 265 minutes down to 166. That meant 99 minutes were removed from Kurosawa's original, over one-third of its running time. The cut scenes alone run as long as many movies. Of course, the moment Kuroawa shifted the action from late nineteenth century summertime St. Petersburg to mid-twentieth century midwinter Hokkaido, he altered a key element of the novel. The main characters are all there, but have themselves been adapted intriguingly to their locale. The novel's Prince Myshkin is now Kameda Kinji, freshly released from an Okinawa asylum and on his way to visit Ono, a relative in Hokkaido. Kameda is a war criminal who was sentenced to death but reprieved at the last minute – a traumatic moment that has left him mentally fragile, the "idiot" of the title – and who is unable to lie and whose timid honesty is destined to profoundly effect others. On his journey he encounters the self-assured Akama, and despite their considerable differences the two strike up a friendship. Their paths cross again later over the notorious and beautiful Nasu Taeko, a woman due to be married for a sizeable dowry to Kayama, a good friend to Ono, the very person that Kameda is visiting. This is where things really get complicated. Kayama, you see, is a weak-willed man who is marrying for the dowry but is really in love with Ono's younger daughter Ayako. Akama, on the other hand, is in love with Taeko and is bullishly determined to win her hand. Kameda also falls for Taeko, who is won over by Kameda's simple honesty and devotion, but believes her own troubled past would destroy him. And the young Ayako, well she only goes and falls for Taeko. Following this? In terms of character and plot development, Hakuchi is likely to prove initially a little confusing to those not familiar with the novel. This is not the fault of the director but the aforementioned butchering of his original version. Having such large chunks of narrative and character detail removed (their placement usually indicated by sometimes unnecessary-seeming wipes or, in a couple of cases, textual explanations) results in the story moving forward in sometimes sizeable fits and starts. Relationships in particular, developing or otherwise, require close attention to follow in detail. What is most surprising, given all this, is how compelling much of what remains still is. Slowly paced and at times theatrical in its organisation of character and action, the Hokkaido winter setting invests every scene with a brooding, almost other-worldly atmosphere. As snowstorms rage and winds mournfully howl, they create a sense of dislocated bleakness that seems to isolate the various locations from the real world and at times even suggest that portions of the action are taking place in a surreal underworld. This is never more vividly realised than when Kameda visits Akama in his semi-derelict mansion – decaying and snow infested, it proves a vividly expressionistic representation of Akama's mindset and his increasing isolationism, carried through in the lighting, framing and darkly moody score. 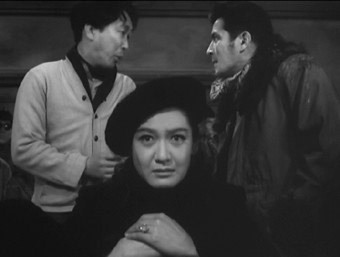 Repeatedly Kurosawa sets up shots in triangular fashion, with two characters at the edges of frame discussing, addressing or being observed by a third positioned centrally, reflecting the Taeko-Akama-Kameda love triangle at the film's core, a technique tellingly first triggered by a window poster of Taeko bordered by the spellbound reflections of Kameda and Akama. Elsewhere the camera placement can be every bit as striking, not least the shot of Kameda viewed through glass trays of meat knives, recalling both the suggestive handling of a similar knife in a previous scene and anticipating an attack that is shortly to follow. 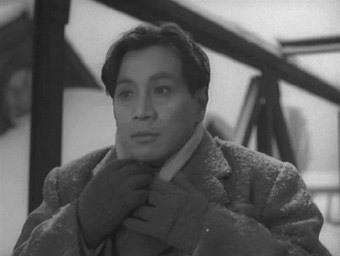 Editing and sound are also used to sometimes impressive effect, with the jump-cuts to Akama's eyes as he watches Kameda's departure from the mansion prefiguring Hitchcock's famous pecked-out-eyes edits in The Birds, while the rapidly cut shots of the approaching masked skaters at the ice festival have a hint of the madness into which two of the characters are soon to descend. The novel's presentation of Myshkin as an almost saintly figure of purity and innocence (many have seen him as Christ-like) is effectively captured here. While Akama and Kayama barter monetarily for Taeko's affections, Kameda has only his honesty and decency, something neither of his would-be rivals can compete with, but he has reckoned without the complications of Taeko's past. Both she and Akama develop complex relationships with Kameda. Although she believes her own history would be harmful to him and tells him he should marry Ayako, she never really stops loving him, while Akama, jealous of the natural innocence that Taeko finds so bewitching and at one point threatening his life, sternly defends Kameda when he is hit and even invites him to share tea and cakes with his mother. This complex inter-relationship leads to a memorable final scene with Kameda and Akama, drawn largely from the novel but as dark as anything in the director's oeuvre. Mori Masayuki, later so memorable as Genjurô in Mizoguchi's masterpiece Ugetsu Monogatari, makes for an enigmatic Kameda, eyes wide with innocence, his hands held almost defensively to his chin, but he's given a real run for his money by Mifune Toshiro as Akama, a figure of obvious influence and power whose grip on reality is gradually warped by his obsession for Taeko. It's a performance that has copped charges of over-theatricality from some quarters, but for my money he hits just the right note. A similar charge has also been levelled at Hara Setsuko as Taeko, but again seems a little harsh – in a film in which the lead characters are emotionally destroyed by their relationships with one another, a little madness seems only appropriate. Hakuchi may not be one of Kurosawa's finest achievements, and in this severely truncated form it's impossible to properly judge it as a complete work. But it's still an often fascinating film and remained to his death one of the director's most cherished projects, his only stab at adapting the work of his favourite author. Inevitably, it leaves you aching to see the full 265 minute version in its full, uncut, two part glory. That we probably never will puts the film on an exclusive list of time and fate enforced cinematic tragedies. As with Kurosawa's Scandal, the good people at Masters of Cinema had some pretty iffy original material to work with and in some ways the results reflect that, with the picture lacking punch and the contrast range not all it could be. But in other ways it delivers – sharpness and detail vary but are often rather good, daytime exteriors are sometimes very pleasing and print damage has been very effectively cleaned up. The mono soundtrack displays more obvious problems, with an occasionally very noticeable background hiss that appears and disappears from shot to shot in some scenes, and there are a fair few minor but noticeable pops in places. That said, the sometimes inventive use of sound – sleigh bells that rise in volume with Kameda's increasing distress, the audio accompaniment to Kameda's recollection of a witnessed execution (a technique later emplyed by David Lynch in a key scene of The Straight Story) – and the dialogue are all clear enough. The expected Introduction by Alex Cox gives an interesting overview of the film and the problems resulting from the cuts. The Gallery includes 19 production stills, 2 portraits of the cast and the director, with separate enlargements of Kurosawa and the original poster, all in good condition and reproduced at a decent size. Finally there is the usual, rather lovely Masters of Cinema Booklet. Running 36 pages, which are primarily filled with a detailed and enjoyable essay on the film by New York based writer Daryl Chin, though there is also a shorter but equally useful piece by Yoshimoto Mitsuhiro. A bit of research shows there is a fair amount of support out there for a film that some will no doubt pass off as a misfire or even an interesting curio. That we don't have and probably never will have the full version is a loss to cinema, but that the this version has been so restored by Masters of Cinema is something to be thankful for. Yes, you'll need to bring your patience with you, but there are genuine rewards here for the discerning viewer, and it has its own particular fascination both as a lesser-seen work of one of cinema's greatest directors, and as an adaptation of one of literatures most celebrated novels. * As it happens, the most detailed and faithful adaptation of the novel, shot for Russian TV in 2003 by Vladimir Bortko, runs for 550 minutes. The Japanese convention of surname first has been used fo all Japanese names in this review.